Part 5 of the TOGAF documentation describes tools and techniques for managing the vast volumes of information that architects gather and use. 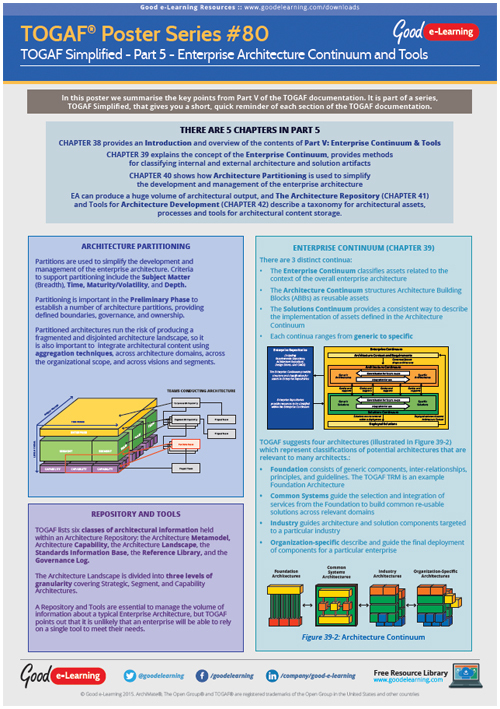 Our poster by enterprise architecture expert Roger Evernden provides a useful summary of the key techniques and approaches recommended by TOGAF. Dont forget – this is part of our poster series on Simplifying TOGAF. If this TOGAF 9 resource interests you, why not view our range of Enterprise Architecture courses. Or view our full library of downloads covering a wide range of subjects and domains!